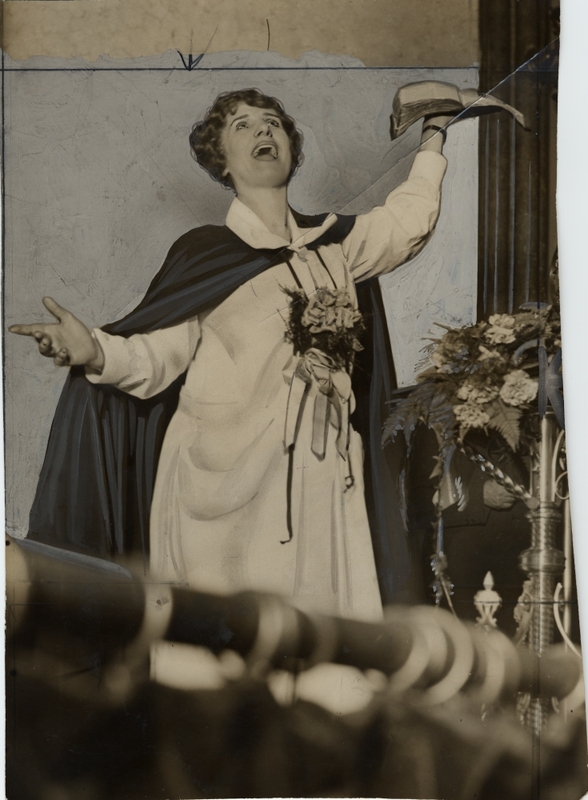 A pioneer in what we now call televangelism, using radio and film to spread her preaching, Aimee Semple McPherson was the first woman granted a license by the Federal Communications Commission, earning her the nickname "Our Lady of the Loudspeaker" from writer Dorothy Parker. She was so popular and visible a public speaker that she's been called "the closest thing to Oprah Winfrey in early 20th-century America," even though she died before the advent of television. She built the first megachurch, seating 5,000, in Los Angeles and filled it sometimes daily. Sister Aimee, as she was known, was a woman who wanted to be heard. But she did more than speak and promote her Pentecostal message. Sister Aimee fed more than a million people in Los Angeles during the Great Depression and some credit her with keeping the city's Mexican population alive at that time. She welcomed black and Hispanic worshipers in an unusually diverse ministry. And she sometimes risked her reputation, with many failed marriages, rumored affairs and charges she had staged her own kidnapping. Surprise your critics with the unexpected: Like many women speakers, Sister Aimee's critics took a "how dare she?" tone about her promotion and prominence. This quiet and simple talk proved she was equally impressive with a small crowd and an intimate tone. Don't be afraid to broadcast your words: McPherson used every tech tool available, and created a lasting legacy as a result. Unlike many famous woman speakers, we have an ample record of her speeches and sermons, including this one. Preach beyond the choir: Talking to gambling drinkers in a speakeasy was not her regular approach, but Sister Aimee was reaching an important if unlikely audience--and so should you if you want to influence more than the groups that agree with you. The key: Speak to them with as much respect as the people who are already your fans. Keep it brief and direct: There's no question this is a persuasive speech. Don't confuse length with effectiveness. Here's video of Sister Aimee from a newsreel on Prohibition, to give you a sample of her speaking style. What do you think about her speaking?